The spare parts catalogue offers a glimpse inside our products: details such as the dimensions and structure of the mixers, showers, wash basins and accessories. An interactive exploded view illustration shows how the many individual components fit together, enabling the complete Hansgrohe quality product to offer exceptional experiences of water and of comfort. Having information on all the available service parts will bring about fast results, should you ever have a query on a bathroom product. The electronic spare parts catalogue lists both current and historic bathroom products and is constantly being updated. 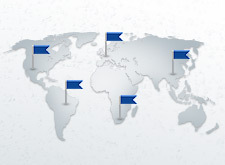 The nearest sanitary specialist is your best point of contact for resolving any problems. Drawings, technical information, service parts. For both current and historic products. You can also access the spare parts catalogue from the individual page of each item under the “Products” tab. 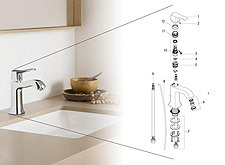 Hansgrohe expressly recommends that you take the professional plumber route if you have any service requests, since he will install or repair high-quality products and spare parts professionally.